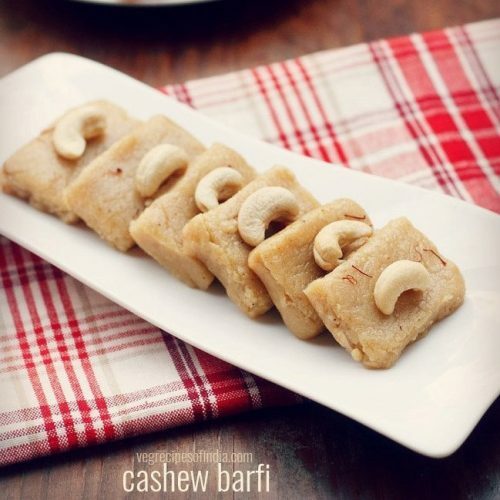 delicious and easy kaju barfi made with cashews, khoya (evaporated milk solids), ghee, sugar and cardamom powder. measure and keep all the ingredients ready for the kaju barfi recipe. grease a tray or dish with some ghee or oil and place aside. add 1 cup of cashews in a dry grinder or coffee grinder. grind to a fine powder. the cashews powder should be dry. the fat should not release from the cashews. so while grinding, use the pulse option for a few seconds. scrape the sides and then again pulse for a few seconds. you can also grind for a few seconds, then scrape and then grind again for a few seconds. keep the powdered cashews aside. heat a thick bottomed pan or kadai. reduce the flame and add one tablespoon ghee. when the ghee melts, then add 2 cups of grated or chopped mawa. mix and stir very well. the mawa will start melting. once the mawa starts melting, add ½ cup sugar. again stir and mix very well. keep stirring until sugar dissolves. you will see a molten liquid like state in the mixture. once all the sugar has dissolved, then add the ground cashew powder. on a low flame begin to mix. also add ¼ teaspoon cardamom powder. continuously keep stirring the barfi mixture on a low flame. cook the mixture for some minutes on a low flame, till the mixture begins to thicken and leave the sides of the pan. when the mixture leaves the sides of the pan, then pour the kaju barfi mixture on a greased tray or plate. take care while pouring the barfi mixture as it will be hot. so use tongs or gloves to avoid any burns. allow the kaju barfi to cool at room temperature. it will set as it cools down. slice the kaju burfi into square or diamond shape. you can also garnish with some cashews if you want. serve kaju barfi as a diwali sweet. refrigerate them in an air-tight box. these barfis will stay good for about a week in the fridge. cook the barfi mixture on low heat and keep stirring continuously non stop. the recipe can be doubled or tripled. you can add more sugar if you want.